The TFP controls have been upgraded and improved, and were used at WOC 2016 in Sweden and WOC 2019 in Norway. 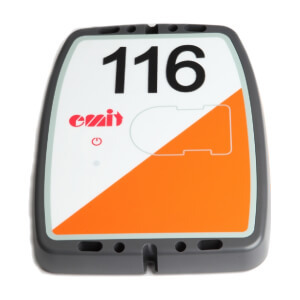 The signal range with emiTags is up to 75 cm standing still, while it is approximately 30 cm moving at high speed. Alternatively conventional E-cards can be placed “in contact” with the designated area showing the silhouette of an ecard, to also register a punch. TFP controls are normally made with codes from 100 to 199, plus START and FINISH, although 70-85 & 200-235 can also be specially produced. The TFP controls are compatible with all ecards and emiTags. A longer range TFP will be available later in 2019 with a 150 cm range for use in MTB events.